Looks like we're on a roll with the Herr's cheese curls - seeing as I bought a number of varieties last week, I figured I might as well make a series out of the reviews. Deep Dish Pizza curls are truly worthy of inclusion in the series. Like the Jalapeno Poppers flavor, they capture the essence of the food they are imitating, and do it in a crazy simple way: coating the surface with different blends of powdered cheeses and spices. Thanks to noticeable notes of romano cheese and oregano, the curls have a very authentic taste. Herr's even manages to fool our tastebuds into thinking there might be some kind of tomato involved in the charade, but I checked the ingredients panel and found that there were no tomato-based ingredients (like tomato powder, for example) used - although maybe that came under the umbrella heading of "spices" or "flavors." 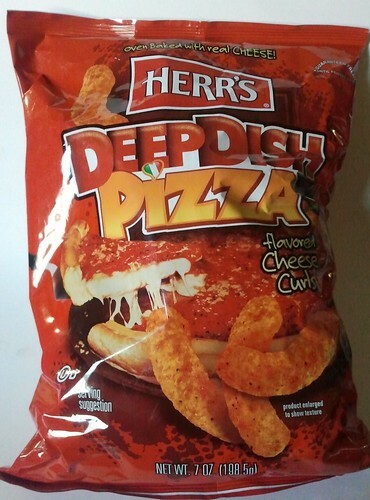 Regardless of tomato inclusion status, Herr's Deep Dish Pizza cheese curls accomplish what they set out to do: Delivering a crunchy and addicting pizza flavor while simultaneously coloring your fingers orange. I found that Herr's does well with whatever flavor they try to imitate. I loved their Buffalo Wings version. Excellent flavor imitation. 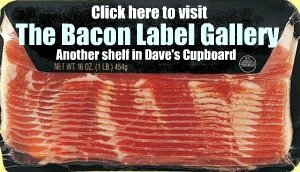 Unfortunately, not always on the shelf at Job Lot, as you would know.